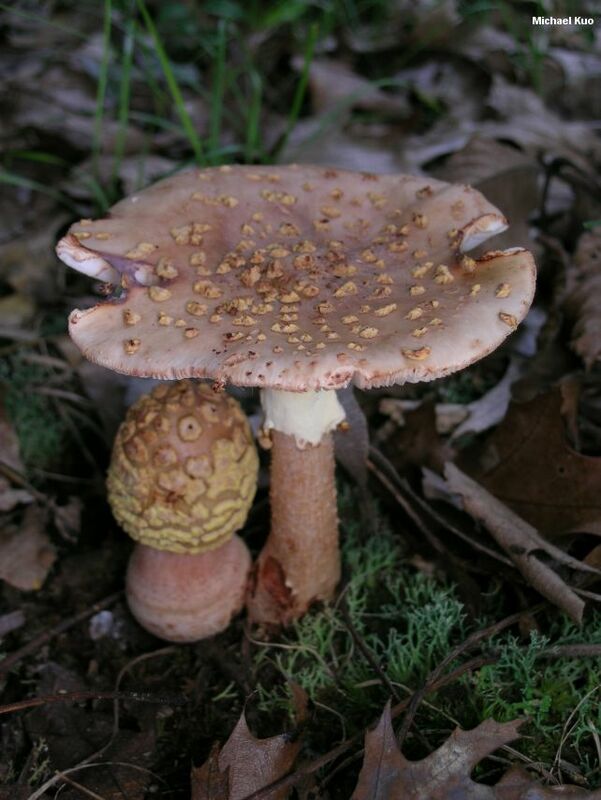 This beautiful amanita is widely distributed and common in eastern North America. It can be distinguished by its indistinct stem base (which lacks a prominent, sacklike volva or other distinguishing features); its brassy yellowish to dull brownish cap, which is adorned with warts that are yellow at first, but turn grayish to tan with development; and its tendency to discolor pinkish red to rose (which is why it is sometimes called the "Blusher" in field guides). 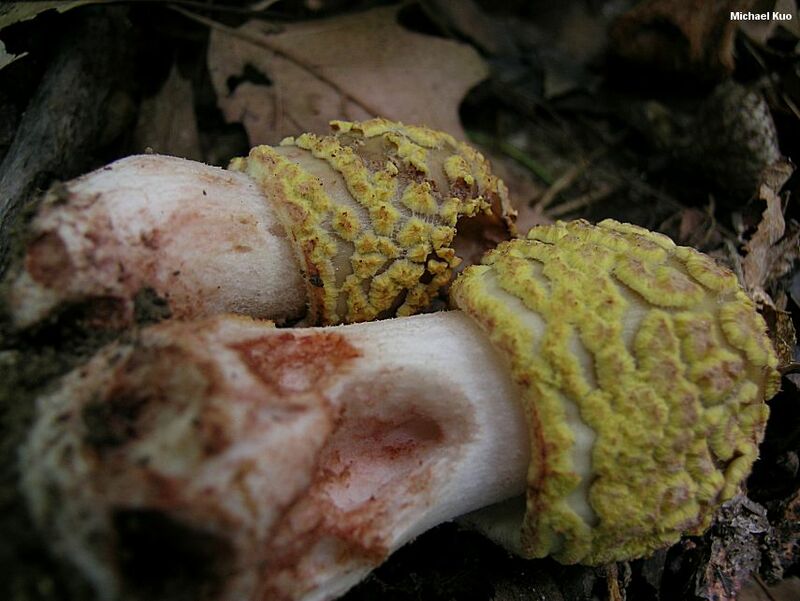 Another common "blushing" Amanita species in eastern North America, Amanita flavorubescens, has a brighter yellow cap surface, with warts that remain yellow throughout development. 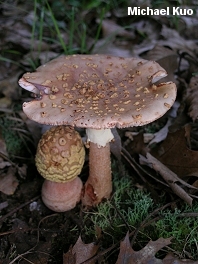 Amanita rubescens var. alba has a whitish cap. 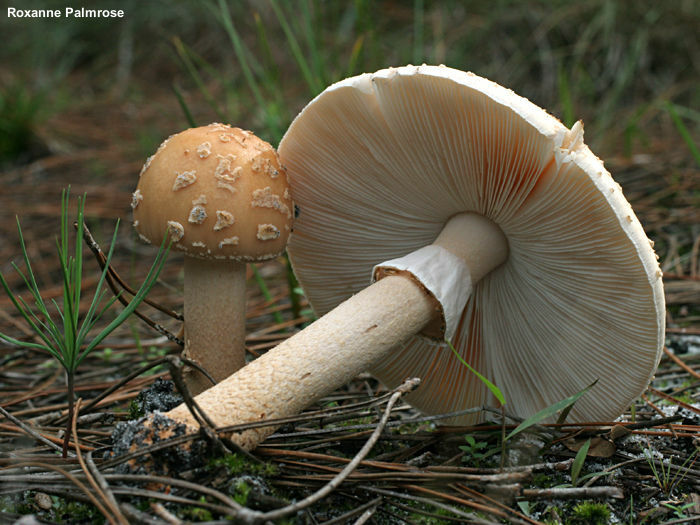 The western version of Amanita rubescens is Amanita novinupta. 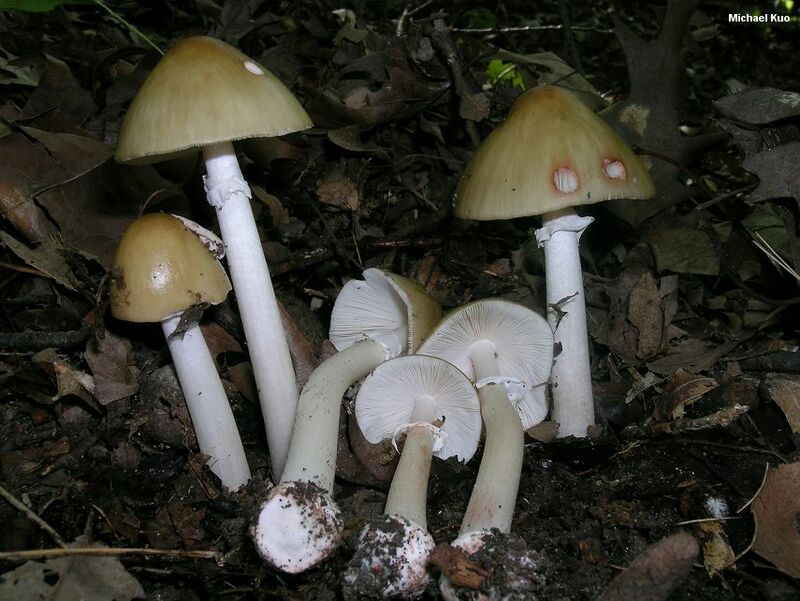 Our eastern North American version of Amanita rubescens is probably not really the same, phylogenetically, as the original Amanita rubescens of Europe. Actually there are probably several unnamed eastern North American species; a detailed study of this group is needed, although Amanita expert Rod Tulloss has provided preliminary documentation for several eastern North American versions of Amanita rubescens sharing the provisional name of "Amanita amerirubescens." 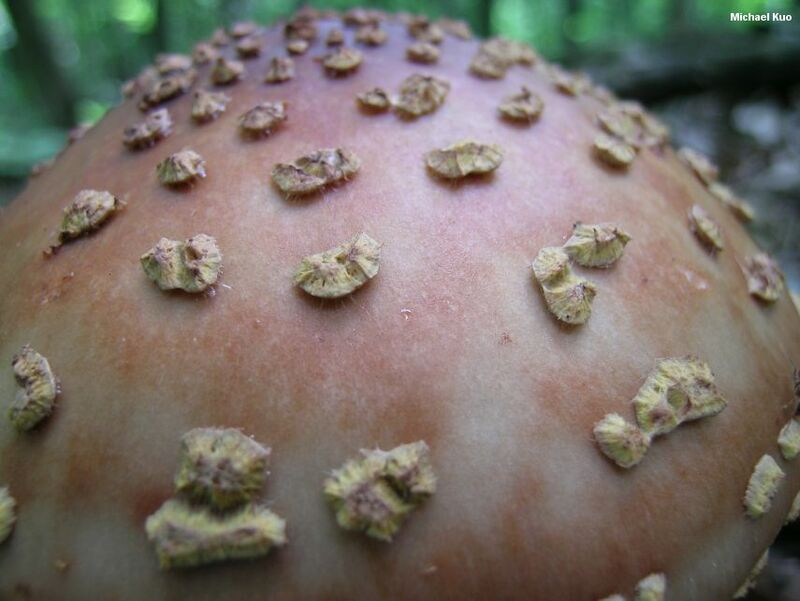 To see what happens when Amanita rubescens is attacked by aliens from outer space, see Hypomyces hyalinus. Ecology: Mycorrhizal, primarily with oaks, but versions are found under pines and other conifers, as well; growing alone, scattered, or gregariously; summer and fall, or over winter along the Gulf Coast; widely distributed, as a species group, east of the Rocky Mountains. The illustrated and described collections are from Illinois, Québec, and Florida. 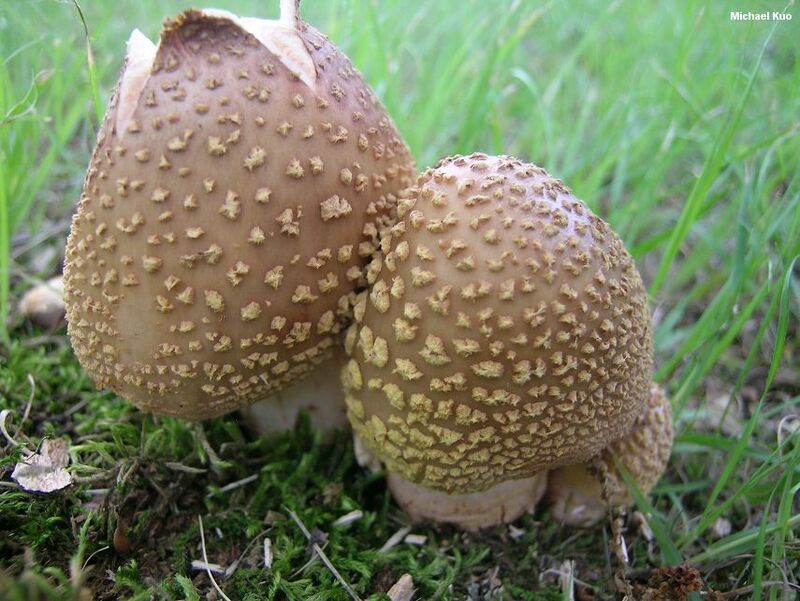 Cap: 4–15 cm; convex, becoming broadly convex or flat; dry or slightly sticky; adorned with with numerous felty warts that are bright yellow and densely packed at first, but soon spread and fade, becoming pinkish, grayish or dull tan; surface dull brassy yellow to dull brown when young, becoming flushed with red shades, and eventually turning reddish brown to tan or brown; the margin typically not lined. 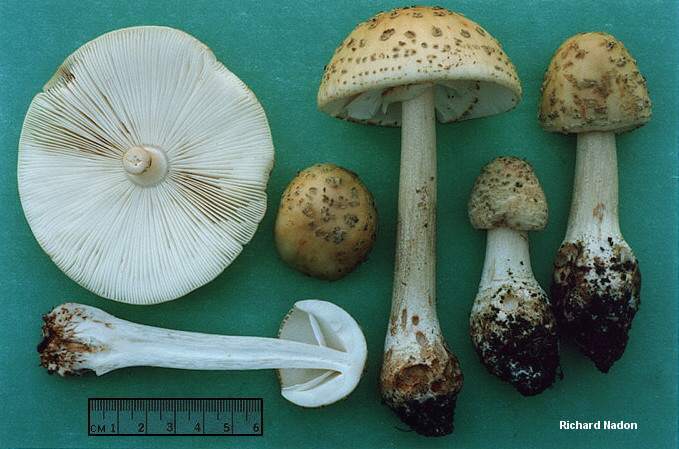 Gills: Free from the stem or narrowly attached to it; white, sometimes discoloring reddish; close or crowded; short-gills numerous. Stem: 5–18 cm long; 1–3 cm thick; more or less equal, or sometimes slightly enlarged toward base; the base indistinct to bulbous; generally without universal veil remnants; without a rim; white at first, becoming stained pinkish to dirty red; bald or finely hairy; with a fragile, persistent ring. Flesh: White throughout, discoloring slowly pale pinkish red, especially around worm holes. 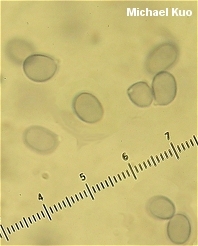 Microscopic Features: Spores 6–10.5 x 4–7µm; smooth; ellipsoid; amyloid. Basidia 4-spored; without clamps. Pileipellis a cutis or ixocutis of hyphae 2–7 µm wide. Lamellar trama bilateral; subhymenium cellular. REFERENCES: Persoon, 1797. (Fries, 1821; Saccardo, 1887; Kauffman, 1918; Smith, Smith & Weber, 1979; Weber & Smith, 1985; Jenkins, 1986; Phillips, 1991/2005; Lincoff, 1992; Metzler & Metzler, 1992; Horn, Kay & Abel, 1993; Barron, 1999; Roody, 2003; McNeil, 2006; Miller & Miller, 2006; Binion et al., 2008; Tulloss, 2013.) Herb. Kuo 06239502, 08300211, 07070711, 06221011, 06231302, 12101503. Thanks to Roxanne Palmrose for collecting, documenting, and preserving some of the illustrated and described specimens.